This list of resources was discovered on tumblr and provided by “garçonnière,” a critical queer artist/writer living in Québec City. It’s a great list and along with this resource she has great content on both her wordpress and tumblr blog so Mixed Bag Mag recommends following her there as well as on twitter @garconniere and facebook. Many of my friends have been asking me what Idle No More is about: where to begin, what’s happening, why now, what’s next, etc. Although I’m well versed in many of the issues Idle No More addresses, have studied post-colonial theory, and have even covered some of the resistance to colonialism (in Caledonia/Six Nations, Grassy Narrows, and Sharbot Lake) – this feels like an overwhelming question. Partly because… well, it is an overwhelming question. 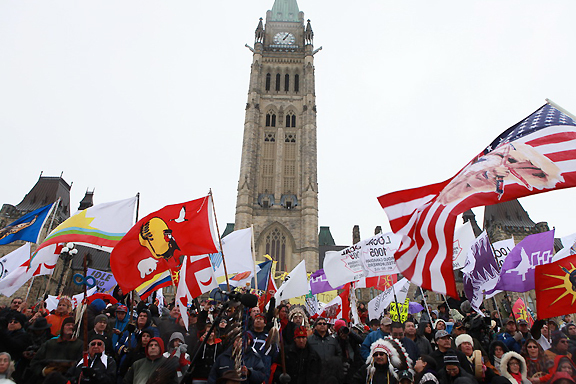 Idle No More is a complicated movement because it is tackling a messy, tangled history – the history of colonialism, and the many incarnations of resistance to it. That said, I’ve been consuming content voraciously, so here’s the best of what i’ve come across. reblog and add your favourite analysis/resources!